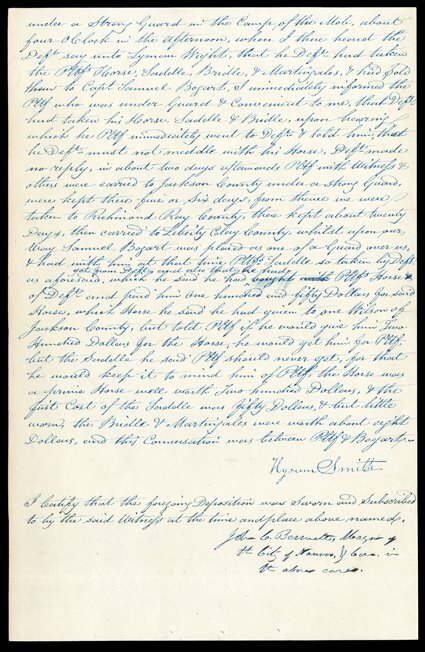 [The Prophet's Wife and Brother give statements on property stolen in the 1838 Mormon War], Emma Smith and Hyrum Smith. "under a Strong Guard in the Camp of the Mob. I there heard the Deft. Say unto (apostle) Lyman Wight, that he Deft. Had taken the Pltfs. Horse, Saddle, Bridle, &Martingales,&had sold them to Capt. Samuel Bogart. I immediately informed the Pltf. Who was under Guard & Convenient to me In about two days Pltf. With Witness & others were carried to Jackson County were kept there five or Six days, from there we were taken to Richmond Ray County, there kept about twenty Days, then carried to Liberty Clay County," and that in that time Bogart guarded them, and Hyrum saw him with his brother's possessions..."
In 1836, the Missouri State Legislature made provisions for the Mormon settlers to occupy the northwest county of Caldwell separating the Mormons from the Old Settlers. However, newly arrived Mormon settlers over-populated the county, which led to further conflicts and the expulsion of the Mormons from Missouri. In 1838 the Missouri governor, Lilburn Boggs, gave the Mormon’s an ultimatum of leaving the state or being “exterminated." Later that year an organized Old Settler mob killed 18 Mormon men and boys. This massacre gave reason for the Mormons to leave Missouri and to settle in Illinois. Witnesses, names of Old Settler mobsters, victims, information on the Mormon paramilitary units and Old Settlers mobs, may be found in the Missouri Mormon Papers. 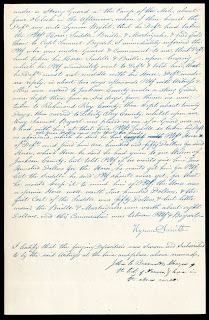 The state legislative investigation of the massacre and official discussions were documented and are held in the Mormon War Papers. These papers also hold the criminal hearing of Joseph Smith and other church leaders for treason and other crimes. Images, text and online searches are available using Finding Aid 5.1 online. To perform an online surname search try the “Search Mormon Records” (mid-page). Thanks for the link, I was always afraid my Hankins family might have been involved in the mobs, but did not find their names.